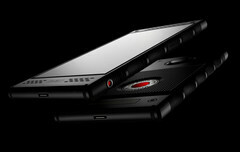 If you've been hankering to get your hands on one of RED's Hydrogen One smartphones, your dreams will soon come true. RED CEO Jim Jannard has announced that customers who have pre-ordered the US$1,295 device will receive them on October 9. US customers on AT&T and Verizon won't receive their orders until nearly a month later on November 2. Those who simply cannot wait that long can get their hands on one through RED's 'Houdini' developer program. The pre-production sample device will ship with pre-release software between August 31 and September 11. However, it will come with a caveat. RED says that it reserves the right to brick a user's phone if any published criticism is anything other than "constructive." Although the Hydrogen One will ship with last year's Snapdragon 835, the emphasis is on its unique display. The company says that the 5.7-inch professional holographic display uses nanotechnology to seamlessly switch between traditional 2D content and what it is calling RED Hydrogen 4-View content (H4V). It also shows 3D content as well as 2D/3D VR, AR and MR video. It won't be long before we know whether RED has made a display breakthrough that other smartphone makers will be tripping over themselves to emulate.